Bula and Welcome to Pacific Property Solutions. Are you considering buying freehold land in Fiji or do you already own land in Fiji and would like to build your dream home? Be it an architecturally designed vacation home or your beachfront hideaway in paradise, Pacific Property Solutions can help you turn your dream into a reality. PPS are fully aware that undertaking a building project in a remote location such as Fiji can be a daunting task. You will not only be making an investment in financial terms but also an investment in time and emotion. With us by your side we will ensure that you make the right decisions from the outset so that you realise the home you desire within your budget. The cost of building a house in Fiji is on the rise. Therefore, certainty in the cost of building your dream home is increasingly important. When we considered the problems of building a quality home in Fiji we realised that kit or prefabricated homes is a great solution. Although Timber kit homes are not a new concept in Fiji the advantages of prefabricating building components is often lost through poor working practices on-site. Taking all of these factors into account Pacific Property Solutions has partnered with 2 kit set companies based in New Zealand; Fraemohs Homes and TRENZ Homes. 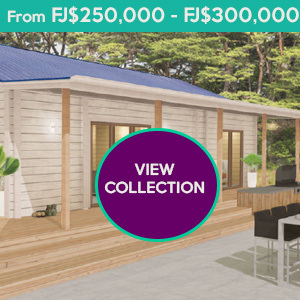 Both companies offer their own unique and versatile range of kit homes that are perfect for Fiji conditions and lifestyle. Fraemohs have been building kit homes for over 50 years. The beauty of the Fraemohs designs is their simplicity in assembly that is based on a Scandinavian technique of interlocking timbers. This removes a lot of the technical skill requirements associated with traditional builds. 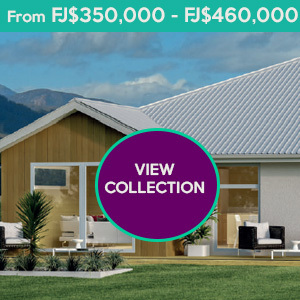 TRENZ have been building kit homes since 2005 their range can be built using either timber or steel framing so you choose which system you prefer at the heart of your build. 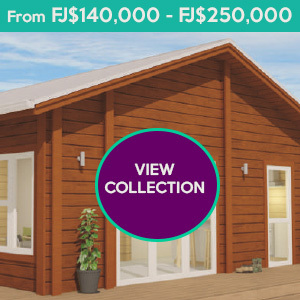 TRENZ have an extensive choice of Pacific designs including a very popular Container Home range. You really will be spoiled for choice! All of these homes are very strong and durable. They have withstood the extremes that New Zealand’s climate throws at them including earthquakes and cyclonic winds. All homes come with fully fitted kitchen and bathroom/s and a full set of working drawings. Inter-island transport, electrical and plumbing, local council fees, professional fees, PPS consultation or project management fees. These prices are a guide only and subject to fluctuations in foreign exchange rates, modification to designs and other professional fees. Pacific Property Solutions have been looking at alternative building methods to those currently being used and found kit homes or pre fabricated homes to be an ideal solution. Kit homes are not a new concept and have been successfully implemented in the building of thousands of homes around the world over many years. 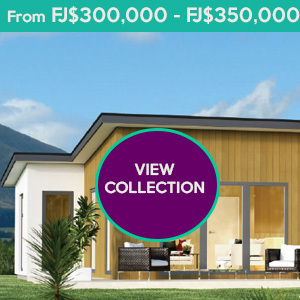 If you’re considering a Fraemohs or TRENZ home for land you’ve already purchased, or have identified land for sale in Fiji that you would like to build a house on Pacific Property Solutions can work with you to manage the process. If you are looking for a site build service we are able to offer this to clients on Vanua Levu and Tavenui Islands. PPS can take the stress out of your site build by acting on your behalf as Project Managers. We offer a range of inspections and independent reports to help you make a more informed buying decision and give you more leverage when putting in an offer. Financial contract management of construction projects from initial budget estimating to financial post contract management.